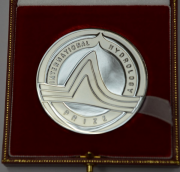 The Dooge medal of the 2018 International Hydrology Prize of IAHS/WMO/UNESCO is awarded to Professor Howard Wheater. 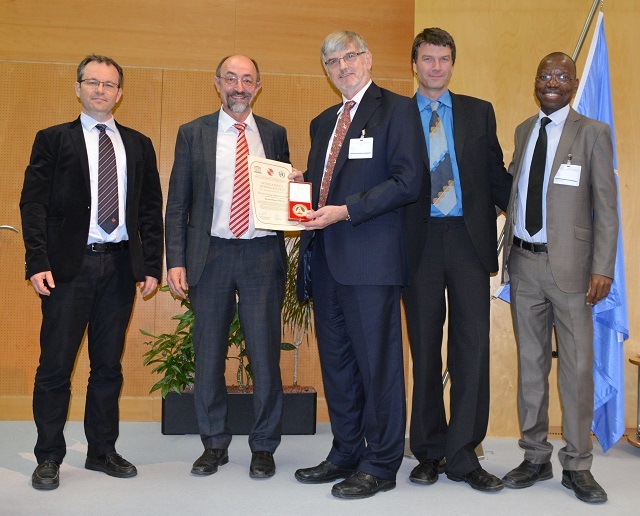 Left to right: Christophe Cudennec (Secretary General IAHS), Günter Blöschl (President IAHS), Howard Wheater (Dooge Medal Recipient), Johannes Cullmann (Director, Climate and Water Department WMO), Abou Amani (Chief of Section HSS, UNESCO). Photos courtesy of WMO. 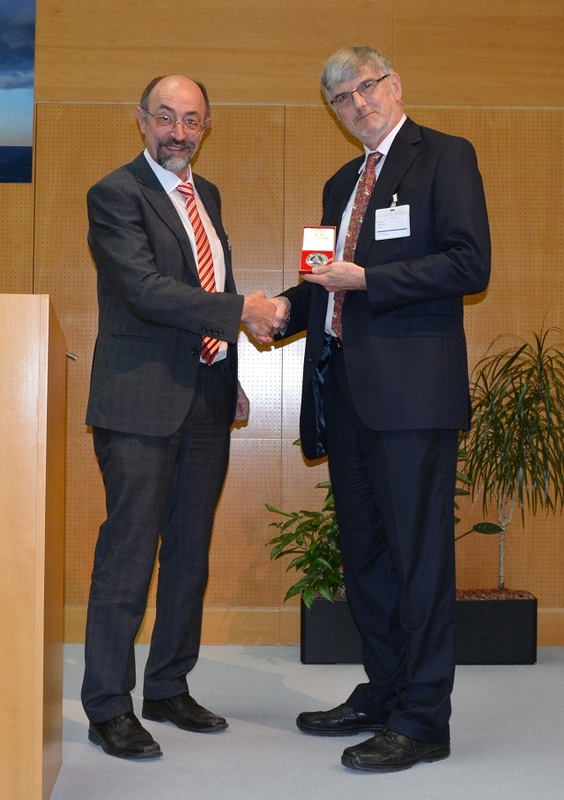 It gives me great pleasure to present Professor Howard Wheater, Professor at the University of Saskatchewan and Canada Excellence Research Chair in Water Security, as this year’s recipient of the IAHS/UNESCO/WMO Dooge Medal. In a hydrological career of more than 4 decades, based in the UK and Canada, Howard has contributed to excellence both in the science and international practice of hydrology, to the development and implementation of national policy, to the resolution of international water disputes, and to the training of hydrologists. Howard’s scientific contributions to hydrology are extensive in quantity and breadth. His work on the theory and practice of hydrological modelling has included important contributions to the provision of new modelling tools, and the development of new methods that have resolved key areas of model limitation. These include modelling of ungauged catchments, new upscaling methods to represent the effects of land use and land management change, and in Canada, the development of improved large scale models for cold region applications. His water resources research led to the development of new approaches to the representation of risk and uncertainty in water resources planning for the UK and new approaches to the analysis of vulnerability to climate and anthropogenic change, applied to complex water resource systems in western Canada. Concern for the limitations of conventional flood design led to the development of stochastic rainfall modelling tools for hourly rainfall, now used for continuous simulation flood modeling in the UK and Europe. Research into diffuse pollution was triggered by the need to address acidification in Europe; important field and modelling studies supported the UK’s Surface Water Acidification Programme, which was instrumental in changing UK policy on sulfur emissions, and later extended to include nutrient pollution in the UK and Canada. His appointment in 2010 as Canada Excellence Research Chair has led to a new paradigm for large scale observatories as a basis for developing new transdisciplinary water science to meet the needs of managing increasingly stressed water resource systems against a backdrop of environmental change and increasing risk from extremes. Much of Howard’s research has been motivated by the needs for improved hydrological science and modelling tools to support improved policy and practice in many countries worldwide. In the UK he advised government on national research to improve flood management practice, and led a major research initiative to quantify impacts of agricultural intensification on flood risk. He was advisor to a Cabinet Office enquiry into the 2007 floods, and participant in two Flood Foresight studies. He initiated the LOCAR lowland catchment research initiative, in which his own research led to new methods to represent the effect of delayed nutrient loads on groundwater dominated catchments, and subsequently advised the Environment Agency on the designation of nitrate vulnerable zones. Howard’s research on modelling radionuclide transport led to his role as Chair of a UK government panel advising on siting criteria for deep subsurface nuclear waste disposal, and he currently advises the State of Nevada concerning the proposed Yucca Mountain high level nuclear waste repository. In Canada he was a member of an Alberta government panel concerned with environmental monitoring criteria for the Province, and chaired a Council of Canadian Academies panel that reported on Agriculture and Water, to identify the science needs for Canada at the water-agriculture interface. Howard has also played a leading role in international water disputes. He was the Engineer member of an International Court of Arbitration that recently adjudicated a dispute between Pakistan and India arising from the Indus Waters Treaty and has been appointed by Chile as an expert in a dispute with Bolivia, currently before the ICJ. In 2017 he was appointed to the ‘Future Water Resource Needs for the Nation’ US National Academies panel, the only non-US member. Throughout his career, Howard has been concerned with the needs of developing countries and has provided leadership in international programmes and training in hydrological science. He co-founded UNESCO’s GWADI arid regions water programme in 1984 and has delivered training courses and workshops across the Middle East as well as in India, China and Chile. In a flood study of Northern Oman in 1981 he developed analyses of extreme precipitation and improved design methods, which remained in use for 20 years. This led to a long term interest in the challenges of arid regions for hydrological science, and a pioneering study in Saudi Arabia in the 1980s provided important new scientific insights as well as regional analyses. Subsequently he carried out studies in Jordan, Yemen, Oman, the UAE, and the USA and developed rainfall modelling tools for Uganda, Botswana and Iran, and rainfall-runoff models for Botswana, Iran, Uganda and the Nile Basin. Howard’s interests in large scale hydrology led to a long involvement with the World Climate Research Programme’s Global Energy and Water Experiment (GEWEX), of which he was vice-Chair until 2014. He also initiated and leads North America’s only current Regional Hydroclimate Project and has organised and led numerous international conferences and workshops. I am deeply honoured by this award, and most grateful to the UK and Canadian IAHS committees for their support, as well as UNESCO and WMO, and in particular to Kate Heal, Chair of the UK committee, for her submission. It is a real pleasure to receive an award in the name of Jim Dooge. I first met Jim in 1973, when he came to Bristol to examine a fellow student’s thesis, and I last met him in November 2005 when we both contributed to a meeting on water at the Vatican Academy of Sciences. He was a great human being – gentle, supportive and encouraging with young researchers; a man of great intellect, who was a leader in the development of linear theory and systems hydrology, and a deep thinker about the development of hydrology as a discipline. He was of course, and remarkably, an eminent politician, former Foreign Minister of Ireland and contributor to the development of the EU. He was also, if I remember correctly, President of ICSU. The names of Jim Dooge and Eamonn Nash are closely intertwined. They were jointly pioneers in linear theory, and both were major players in developing Hydrology as a distinct discipline, firmly establishing Ireland as a major force in Hydrology. Eamonn founded what was to become the Institute of Hydrology at Wallingford, UK, and the Journal of Hydrology, and one of his many achievements was the development of an International Hydrology Programme at UC Galway, and Dar Es Salaam, supported by Irish Foreign Aid – not unconnected to Jim Dooge’s influence in Irish Foreign Affairs. They were role models to me – both with strong interests in applied hydrology and its practice, as well as in the development of hydrological science. I have attempted to follow their example in my own career – marrying research with society’s needs, and in building national and international institutional capability. This award is, for me, recognition of the contribution of many people, my students and post docs, and many great colleagues with whom I have had the privilege of working, too many to name. I would like to pay tribute to Imperial College London, where I had the privilege of working for more than 30 years in one of the best Civil and Environmental Engineering departments in the world, and attracting some of the world’s best to work with me, and to UK Hydrology, which has been a remarkably stimulating and productive environment, with terrific intellects working in the field. I would also like to thank the University of Saskatchewan and the government of Canada, for providing me with truly remarkable opportunities. I went to Canada in 2010 with $30million dollars to spend, with a free hand, and created the Global Institute for Water Security as a vehicle for interdisciplinary integration, and I have just stepped down as director of the $143 million Global Water Futures programme. Canada is the canary in the coal mine for global warming, facing rapid hydrological change, and with many management challenges, but I have left behind what is the world’s largest university-led water programme, and I am sure that with the leadership of my great colleagues, John Pomeroy for GWF, Jay Famiglietti, the incoming Director of GIWS, fellow Dooge medalist, Jeff McDonnell, and Al Pietroniro from Environment and Climate Change Canada, that they will do full justice to these great opportunities. As I approach the end of a long career - it is 40 years this year since I was appointed lecturer at Imperial, and 50 years since I began my engineering studies at Cambridge – I see unprecedented needs and opportunities for Hydrology. I have lived through the revolution that has been brought about by the development of computational capacity – but this is being paralleled as we speak by remarkable new opportunities in sensing and big data. We will see major developments in our understanding of hydrological systems, not least integrating surface and groundwater, flow and water quality, hydrology and ecology, and of course, recognizing that water is a human-natural system, there will be much exciting development of the emerging area of socio-hydrology. Hydrological science is needed as never before – society faces immense challenges to manage water security in the face of unprecedented environmental and societal change. But as I remember Jim Dooge’s contribution, I look forward in hope and expectation that hydrological science will deliver the new science, new tools and user engagement needed to sustainably manage our water futures.